Egg and sperm cells fuse together to begin a unique new life. Certain muscle and bone cells fuse together during development to gain new properties. But cell fusion also is a process that cancer cells can exploit, and new research shows that it may be one of the ways that tumors gain abilities to become life-threatening and resist treatment. Scientists at OHSU in Portland, Oregon, report that fusion of tumor cells with blood cells called macrophages occurs spontaneously in a number of laboratory mouse models, yielding hybrid cells with added powers to mobilize and form new tumors. The researchers found evidence that such fusions occur in people with cancer. 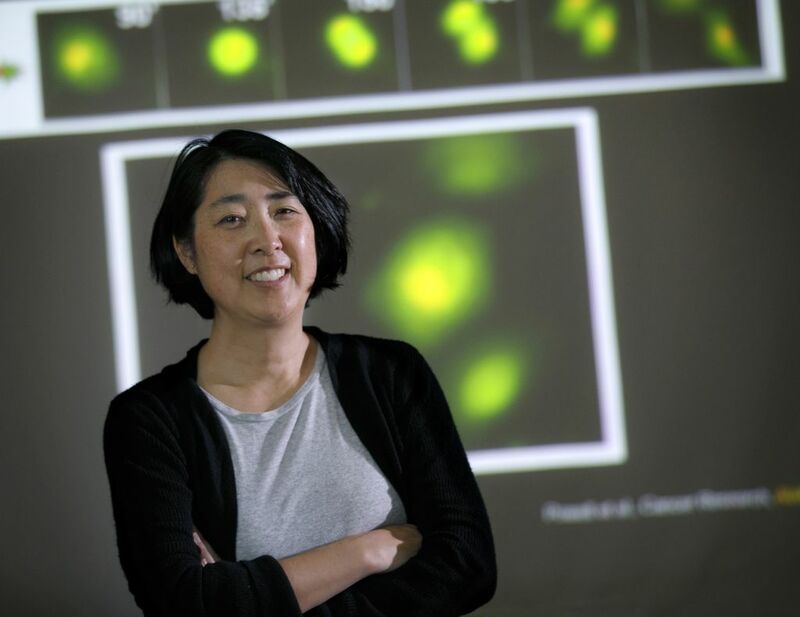 “The process of fusion gives rise to a completely different cell that’s a hybrid of the two parents,” says Melissa Wong, Ph.D., senior author of a report today in the journal Science Advances. “They migrate better, they invade better, they actually can seed and grow in a distant metastatic site in greater numbers than unfused cancer cells.” Wong is an associate professor and vice chair of the Department of Cell, Developmental & Cancer Biology in the OHSU School of Medicine. The idea that cell fusion could generate aggressively spreading tumor cells was first proposed over a century ago by a German pathologist named Otto Aichel. But the occurrence of tumor cell fusion appeared to be rare and its significance uncertain. Fused cancer cells, when they are detectable in tumors, typically account for a fraction of a percent of tumor cells. Wong and colleagues found a striking exception when they looked at blood samples from human cancer patients. Among the tumor cells that make their way into the blood circulation, macrophage-cancer hybrid cells far outnumbered non-fused tumor cells. “While they are pretty rare in primary tumors, in the blood circulation they are the dominant cancer cells,” Wong says. Using laboratory mice, the researchers amassed evidence that macrophage and tumor cell fusions form spontaneously in live animals, retain the ability to form new tumors, and show accelerated tumor progression. In one eye-opening experiment, the team recorded video of green-labeled macrophage cells fusing with red-labeled tumor cells resulting in a red and green labeled hybrid that then went on to divide and give rise to daughter cells that resembled the hybrid. In hybrid cells, the researchers found that genes from both macrophage cells and cancer cells were active. And genes involved in tumor invasion were upregulated in hybrid cells compared with unfused tumor cells. When injected into mice, hybrid cells multiplied faster than unfused cancer cells, and also produced more metastases. The predominance of hybrid cancer cells in blood suggests that they could be harnessed for early detection and tracking of treatment response. To explore the phenomenon in humans, the researchers studied women with solid-organ tumors who years earlier had received a bone marrow transplant from a male donor. In these women, macrophage cells carry a Y chromosome because they arise from male stem cells. Any tumor cell that fused with a macrophage cell should gain a Y chromosome. The researchers looked for tumor cells carrying a Y chromosome in seven women and found them in all seven cases, which included women with kidney cancer, head and neck cancer, lung cancer, and pancreatic cancer. The predominance of hybrid cancer cells in blood suggests that they could be harnessed for early detection and tracking of treatment response. Gene mutations and other properties of tumor cells circulating in blood can provide useful information about the state of a patient’s cancer – without the need for invasive biopsies of tumor tissue. But efforts to use circulating tumor cells this way have been limited by the extremely small numbers of conventionally defined (unfused) tumor cells that circulate in blood. “We’ve found a population of cells that exist at much higher numbers than the conventionally defined circulating tumor cells,” Wong says. Macrophage-cancer hybrid cells are readily identified in cancer patients’ blood. Wong and colleagues compared their abundance at different disease stages in patients with pancreatic cancer. Rising numbers of hybrid cells correlated with advancing tumor stage, and also correlated with lower survival. These finding highlight the potential for using circulating hybrid cells as a biomarker for disease status in cancers where conventional biomarkers haven’t worked, the researchers said. Wong’s laboratory has already initiated collaborations with physicians to see if circulating hybrid cells can be used to track treatment response in patients with cancers that are difficult or impossible to biopsy because of their location, such as brain tumors or uveal melanoma. The researchers say their findings could have other cancer treatment applications. For instance, the relative abundance of hybrid cells circulating in blood suggests that they may be protected from the immune system, and understanding that process could have implications for immune therapy. Cell fusion potentiates tumor heterogeneity and reveals circulating hybrid cells that correlate with stage and survival by Charles E. Gast, Alain D. Silk, Luai Zarour, Lara Riegler, Joshua G. Burkhart, Kyle T. Gustafson, Michael S. Parappilly, Minna Roh-Johnson, James R. Goodman, Brennan Olson, Mark Schmidt, John R. Swain, Paige S. Davies, Vidya Shasthri, Shinji Iizuka, Patrick Flynn, Spencer Watson, James Korkola, Sara A. Courtneidge, Jared M. Fischer, Jerry Jaboin, Kevin G. Billingsley, Charles D. Lopez, Julja Burchard, Joe Gray, Lisa M. Coussens, Brett C. Sheppard, and Melissa H. Wong. Science Advances (Sept. 12, 2018). Cell-cell fusion as a mechanism of DNA exchange in cancer by Stephen C. Searles, Endi K. Santosa, and Jack D. Bui. Oncotarget (Jan. 19, 2018). Cell fusion: A hidden enemy? by Dominik Duelli and Yuri Lazebnik. Cancer Cell (May 1, 2003). The research by Wong and colleagues at OHSU was supported by National Cancer Institute grant nos. U54CA112970 and P30 CA069533, and by National Heart Lung and Blood Institute grant no. T32HL007781. The researchers received additional support from the American Skin Association, American Association for Cancer Research, ARCS Foundation Oregon, Martha and Bruce Atwater, Breast Cancer Research Foundation, Brenden-Colson Center for Pancreatic Health, Collins Medical Trust, Crohn’s and Colitis Foundation of America, Department of Defense, Susan G. Komen Foundation, Medical Research Foundation of Oregon, Melanoma Research Foundation, National Institute of Diabetes and Digestive and Kidney Diseases, Newton Foundation, OHSU Center for Women’s Health Circle of Giving Grant, OHSU Knight Cancer Institute Development Award/Veterans of Foreign Wars Ladies Auxiliary Group, OHSU Foundation, Pfizer Pharmaceuticals, Phileo Foundation, and Prospect Creek Foundation.